Feature your Auctions for More Exposure! Recently, we gave tips on how to get more bids and credits from your auctions, but have you considered featuring your auctions? Featured an auction is simple and is a great way to get gain exposure and drive potential bidders to view your item(s). Users can submit a ticket (with the request type: I am a seller > I want my auction featured) to request their auctions be featured. If your featured request is granted, you will see a Featured icon next to your auction title (viewable in search results). You can also find your auction amongst the other featured auctions located in the Featured Listings page. Include the complete auction URL with your ticket (e.g. http://www.listia.com/auction/4451367-schwinn-mens-and-womans-cruiser-bike. If the complete URL is not included, the auction usually doesn’t open correctly and we cannot feature your item. Using an image of the actual item in hand will give you a better chance of being featured. We will rarely feature an auction with a stock photo as the first image. Include sharp, clear pictures. Blurry and out of focus pictures don’t showcase your item and we will rarely feature an auction with a blurry photo. Long vertical images don’t work very well so try to stick with landscape style photos. Be sure you have good seller feedback with at least a Seller Wings badge. With this new tip, we hope to see your items featured one day! Have a suggestion for a future topic? Tell us here too. Trade Your Way Up to a Vacation or New Car! After a few weeks of beta testing, the Listia Rewards Store has officially launched! The Rewards Store is a shop curated by us where you can redeem your credits for brand new items at fixed (Get It Now) prices. We’re adding more listings all the time, so you can check back every day for new surprises. A Brand New 2012 Fiat 500 POP! If you don’t have enough credits for Premium Rewards, don’t worry – you can start saving up now, or you can shop from a long list of other items. We stock the Rewards Store so there’s something for everyone. Let us know in the comments what kind of Rewards you want to see added to the Store. Happy trading! Browsing through Listia like a speeding bullet! With so many great auctions to see on Listia, browsing through them all can be a bit time consuming (especially if your computer is slow or you have a slower internet connection). You want to find that gem of an auction as fast as possible, right? So let me share with you a little “trick of the trade” that may help you see more auctions in a fraction of the time. This is done using a browser feature that many power-users use—browser tabs. The exact steps may vary from browser to browser, but the general concept still applies across all modern browsers that support tabs (almost all do). And this tip can be used to surf the Internet faster, and not just Listia (IE: Google search results page). 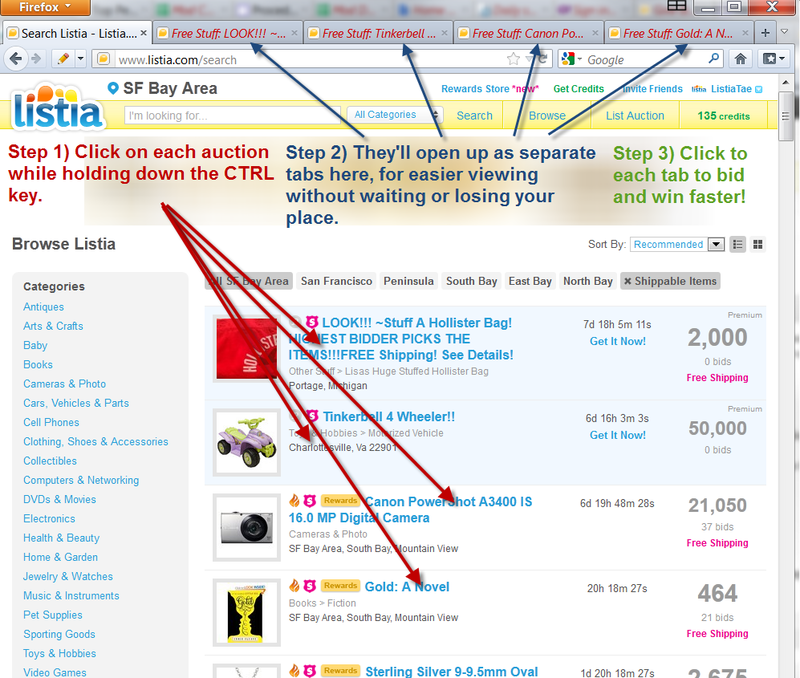 1) Do a search on Listia for anything that you’re interested in, and you’ll get a list of matching auctions. 3) Continue down the list to the next auction that you want to see, and do it again (CTRL click). Keep doing that for all the auctions that you’re interested in, and they’ll be individually opened up in the background as separate tabs in the order you opened them. 4) After you’ve done that to a number of auctions, you can click on each of the new tabs to read, comment, and place your bids. Voila! Once done, close each tab if desired. Click the thumbnail below for an example. Benefits: You don’t have to wait for the pages to load because you’re just continuing on and CTRL clicking on all the ones you want to see first. Meanwhile, the auction pages are all loading in the background and ready whenever you are. And now, you can power through Listia like a speeding bullet, finding more great things to bid on! What other ways do you power through Listia?